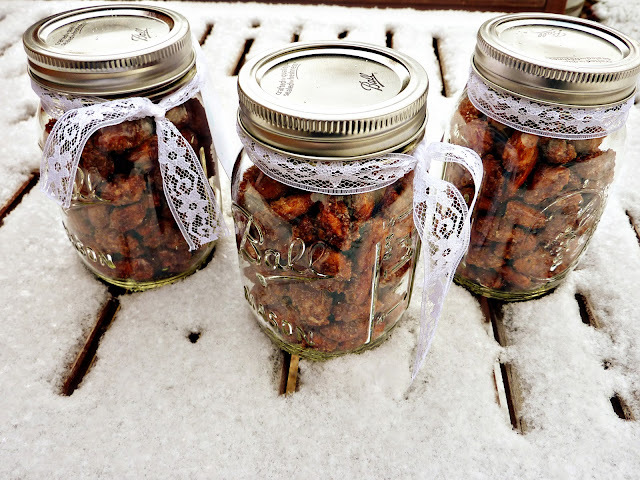 I was looking for a quick and easy homemade gift for the kids' school teachers this holiday. In year's past, I've done craft parties with friends to exchange fun homemade gifts that we can give to all those who are special in our lives - school teachers, babysitters, grandmas and neighbors. Fun projects in the past have included magnets, cookie cutter picture frames, The Beekeeper's magnificent Sugar Body Scrub and lip balm, Mason jars filled with pregnancy tea and relaxing mama bath soak. This year I decided on something fresh from the kitchen. Enter Heavenly Burnt Sugar Almonds, also known as Gebrannte Mandeln in Germany. I started seeing these pop up all across the internets here, here and here, and knew they were calling my name. 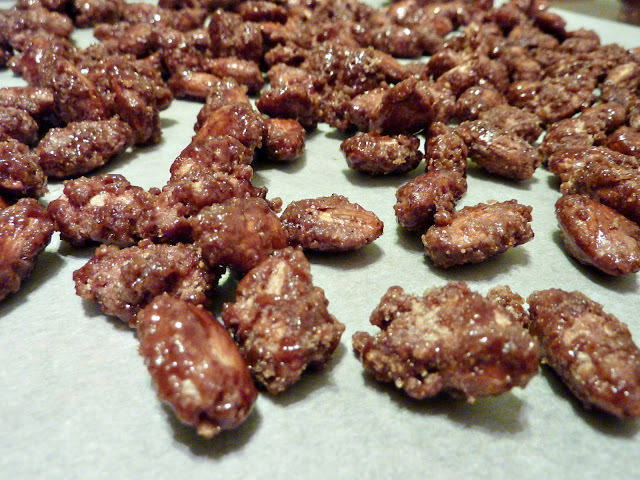 They were fun and realitively easy to make and turned out divine. I will admit it took me a few tries to get it right though. 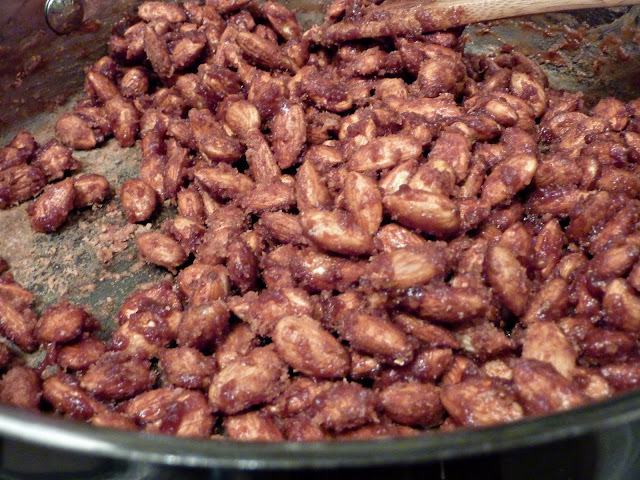 The first batch was completely underdone. Something went wrong in the process. And the second batch was overdone, I was getting close to setting the kitchen on fire. This is evidence that I definitely took the name of this recipe to heart and I made BURNT Sugar Almonds. On my third try I got it right. 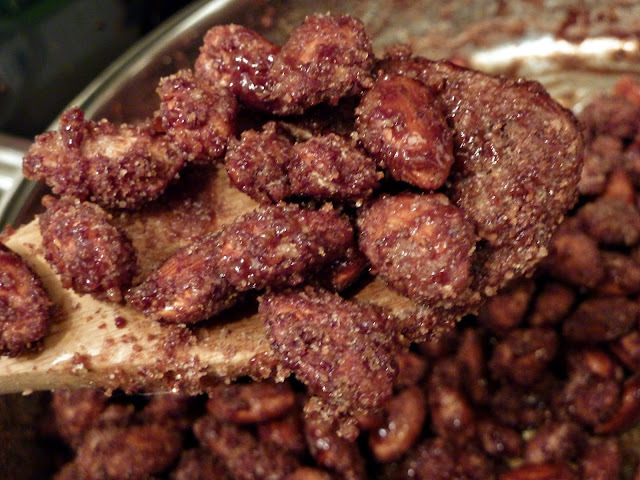 Follow these steps precisely and you will be in Heaven with your perfect Burnt Sugar Almonds. Before you begin, know that this recipe requires your undivided attention and a good dose of that characteristic we were talking about the other day, Sticktoitiveness. I hope you've been fostering the quality because you're gonna need it with these almonds. You'll be stirring the entire 30 minutes it takes to make this recipe start to finish. See what I mean about the Sticktoitiveness? It's a admirable quality. Combine 3/4 C sugar, 1/3 C water and 1 tsp cinnamon in a heavy pan with tallish sides. Do not use a non-stick pan. 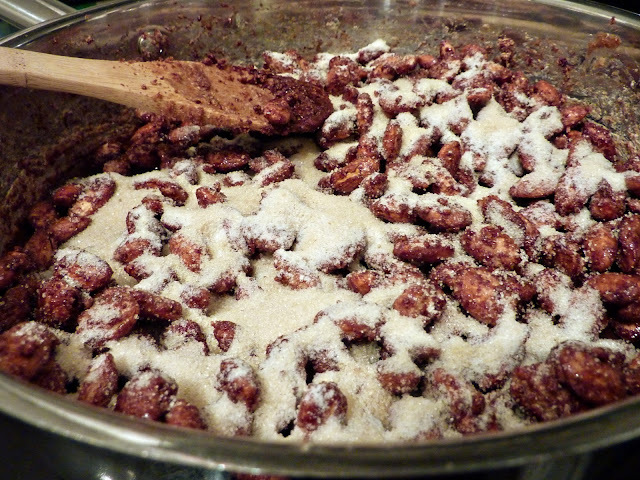 Word to the wise, do not use ultrafine Baker's sugar here, lest I remind you about batch #2 described above. Agh, frightening! Moving on. Stir the water, sugar and cinnamon together. Pour in the almonds. After a few minutes, the water will begin to evaporate from the mixture. It was at this point in the process I thought I might fall over with delight. The aroma rising up from the pan is out of this world. Be prepared to have someone pick you up from the floor should you actually fall over. 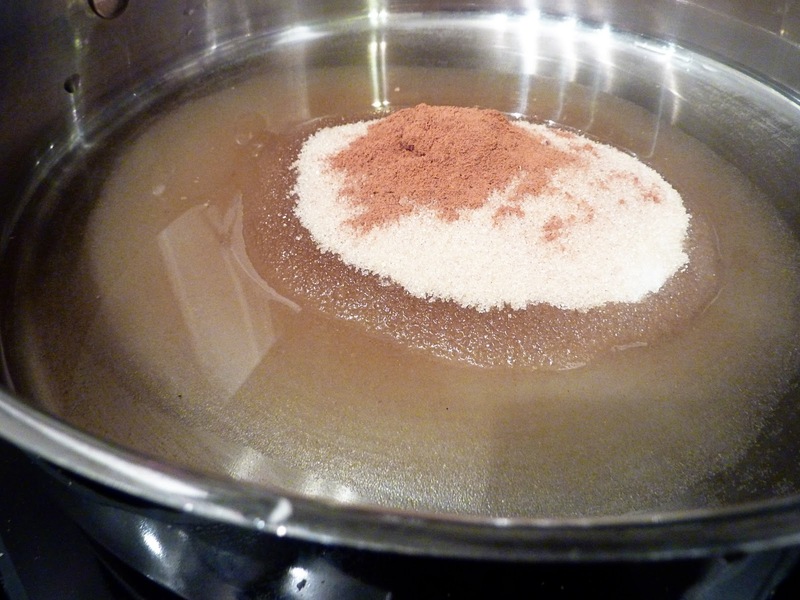 Over the next few minutes you'll watch the sugar mixture slowly begin to dry out. First it will look like this. Then it will look like this. 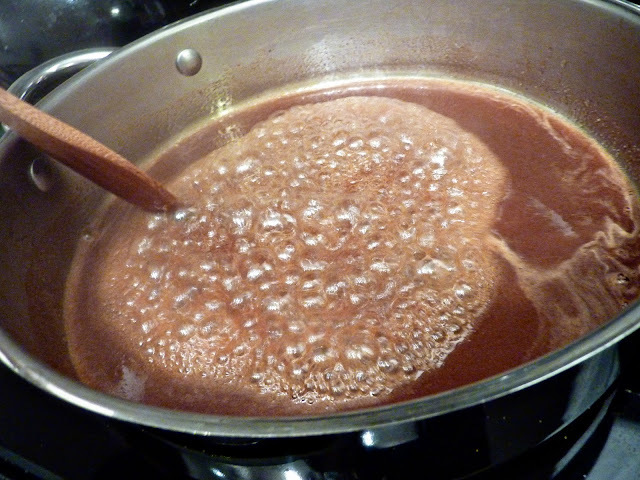 This is the point where my forearms started burning from all that stirring. 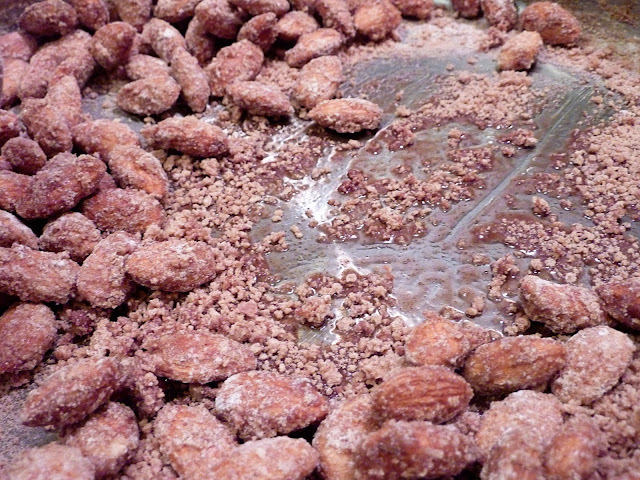 Continue to stir as you watch the sugar transform into a crumbly coating on the almonds. Ah ha! This is what we've been waiting for. 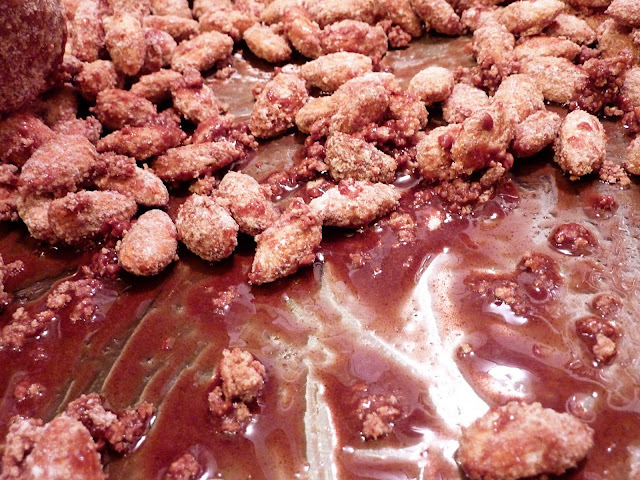 A dry, crumbly, sugary mess. 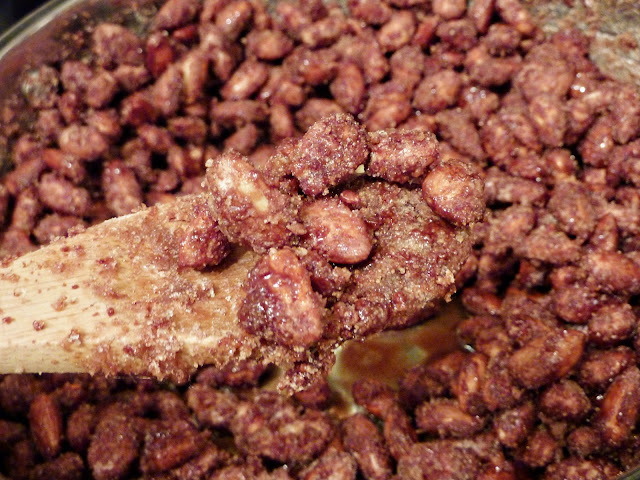 After a few minutes, the sugar will begin to melt. See how it's starting to turn back into a liquid here? It is now time to turn the heat to medium (or medium-low) to keep the sugar from burning, lest I remind you about batch #2 described above. I think not. 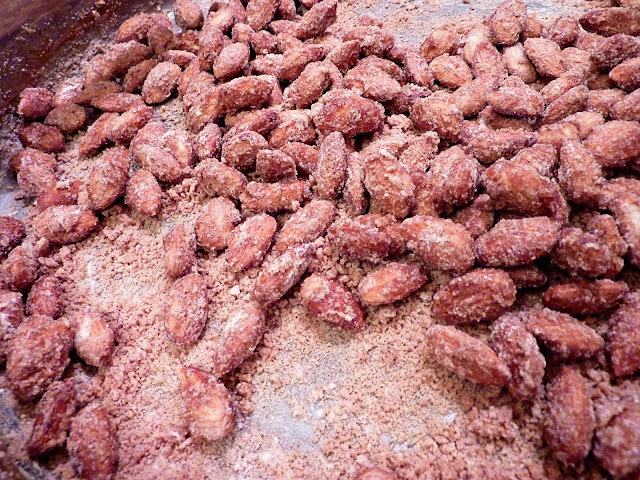 Keep stirring as the sugar continues to melt and the almonds become evenly browned with a shiny coat. 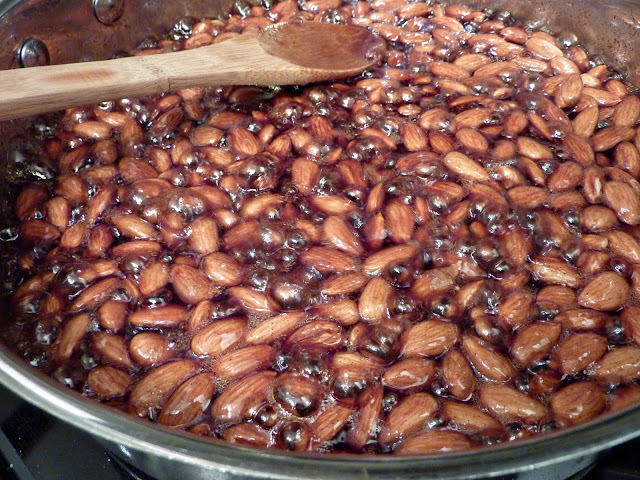 When it appears that the almonds are half shiny and half lumpy it's time to pour in the next helping of sugar, mixed with the vanilla. Add 1/3 C sugar and the vanilla. 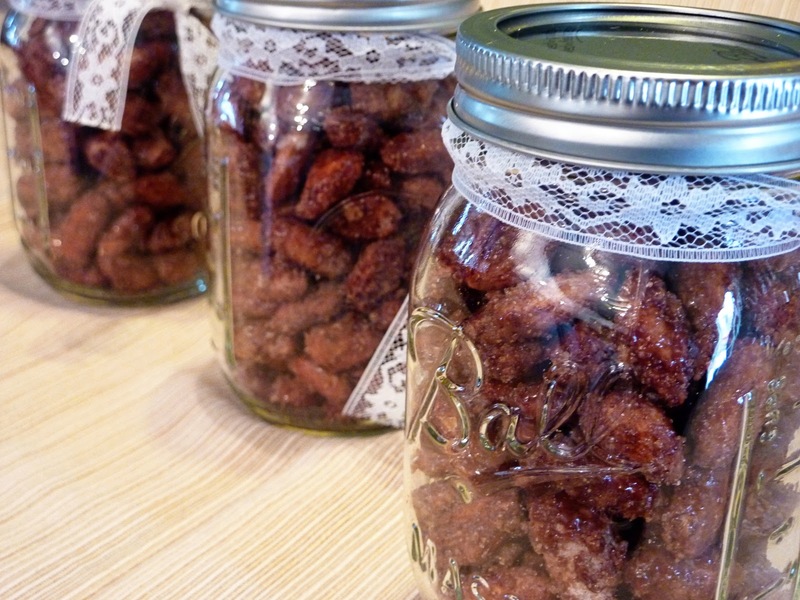 You can use pure vanilla extract, fresh crushed vanilla bean, or dried crushed vanilla bean. Whatever your fancy. Stir it all about. You may hear a few snap, crackle and pops coming from the pan. This is normal as the water escapes from the fresh almonds. 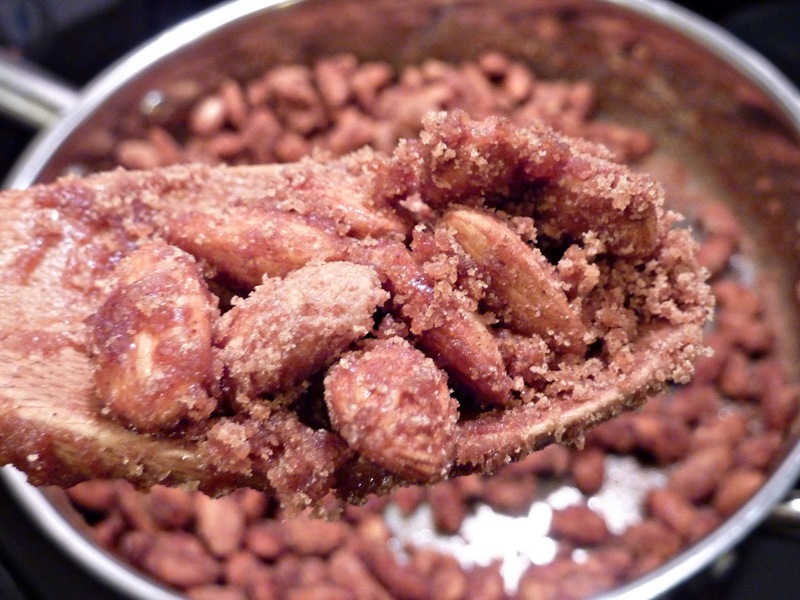 If you're almonds have been sitting on the shelf for awhile they may not snap, crackle or pop. No worries, it doesn't matter. 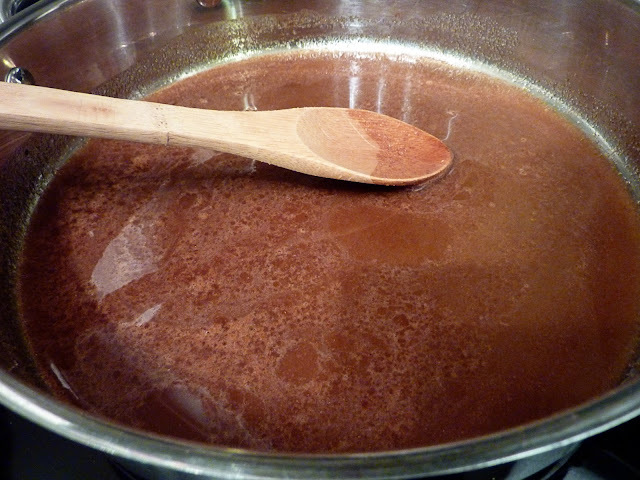 Continue stirring. Once again, the sugar will melt and coat the almonds. Wait until they appear half shiny and half lumpy. This is perfection. 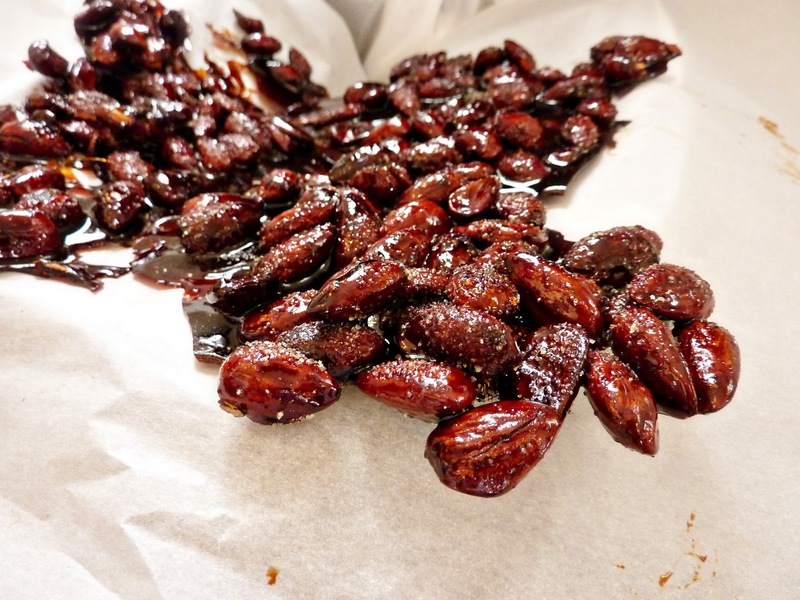 Lay out a cookie sheet or piece of parchment paper and dump the almonds out onto it. 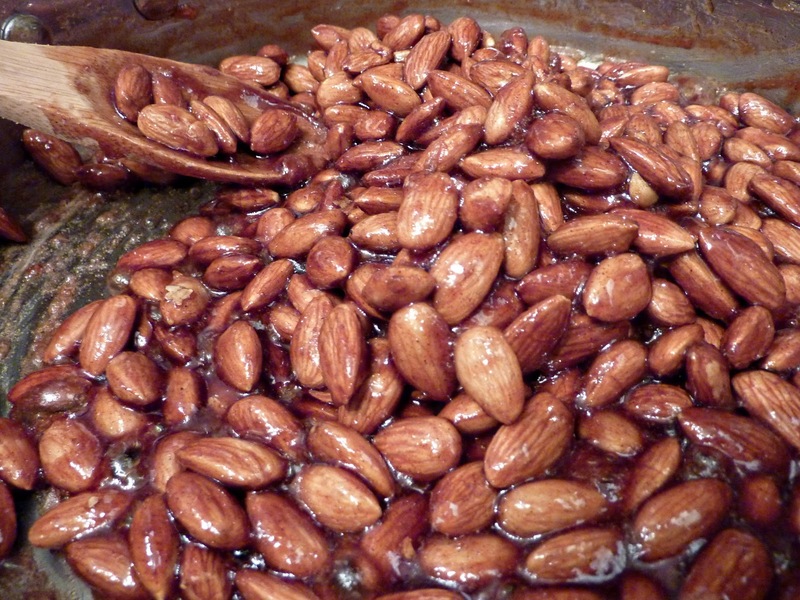 Use a wooden spoon to separate the almonds as they begin to cool. Be cautious as you begin gobbling these little guys up. They are extremely hot and will burn every taste bud from your tongue if eaten too soon. Exercise restraint and wait until they are fairly cooled to try one. They are truly divine while still slightly warm! They make adorable gifts. That is if you don't eat them all first. This is perhaps one of my favorite Christmas tunes of all time. You may wish to play it over and over again as you craft these delightful treats. Heaven knows I did! I have made these a bunch of times and call them my "crack nuts". They are spectacular and everyone adores them. Oh, I like that. 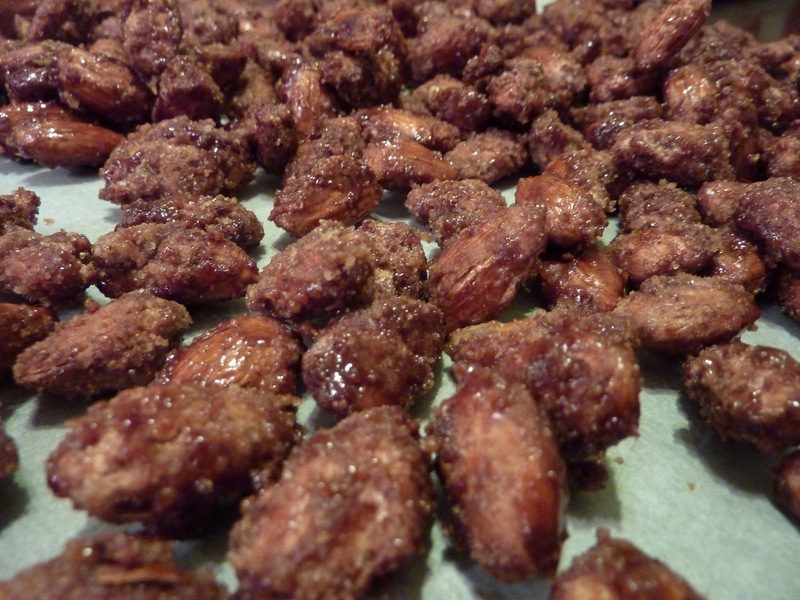 They are my "crack nuts" too. One time and you're hooked. I have to do a lot of self talk to keep myself from making these everyday. So glad someone else out there enjoys them as much as I do!